Crossroads Fellowship exists to help Indiana churches fulfill the Great Commission (Matthew 28:19-20) in the spirit of the two greatest commandments (Matthew 22:37-40) through pastor-to-pastor friendships, area pastor connection groups and statewide conferences and retreats. Any church that is in agreement with our statement of faith and desires to pursue our mission with their time, talent and treasure may join Crossroads Fellowship. For more information please call 812.824.2768. Doug Schroeder is the Executive Director of Crossroads Fellowship. 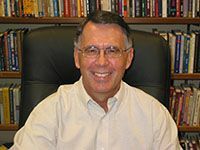 He has served as the Senior Pastor of Emmanuel Baptist Church, Bloomington, IN, for 37 years and has led The Crossroads Fellowship for the past 10 years. Doug understands church ministry and is ready to help you and your church in any way he can. He can be reached at 812.322.9427 or dschroed@indiana.edu. The Board of Directors is composed of elected representatives from member churches. These men assist the Executive Director in leading the fellowship in the fulfillment of our mission. Please feel free to contact these men.